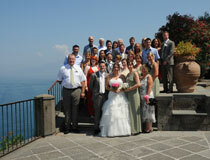 A selection of splendid sea view settings for the best day of your life. Overlooking the Bay of Naples, Sorrento is a popular destination for couples seeking a picturesque setting for their wedding day. Rising up the cliff side with magnificent sea views, Sorrento is located just over an hour’s drive from Naples airport, thus making it a convenient venue for you and your guests. 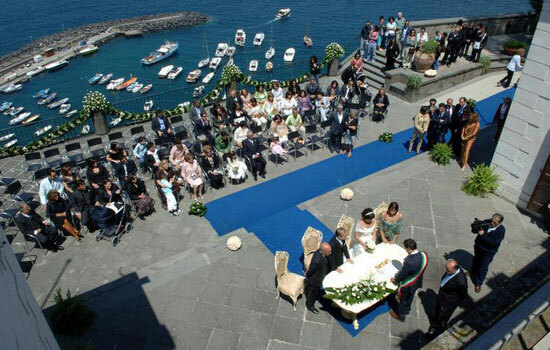 Civil weddings in this very pretty town take place at Chiostro di San Francisco (Cloister of St Francisco), a beautiful medieval building located in the heart of Sorrento. Mature trees, lush vegetation and stone arches create a ‘secret garden’ feel and add to the stunning surroundings of this magical wedding venue. Needless to say that photo opportunities will be plentiful on-site and close-by. 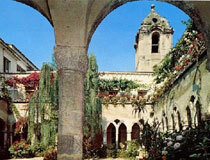 Restaurants and hotels are plentiful in the area and full details will be given to you at the time of booking. 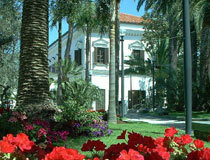 Villa Fondi is the Town Hall of Piano di Sorrento, an area located about 3km east of the main town centre of Sorrento. 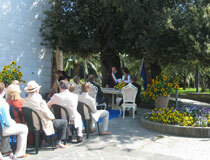 Commanding a scenic location high above a little harbour, the terrace of the 18th century Villa Fondi is a perfect spot for a wedding ceremony. 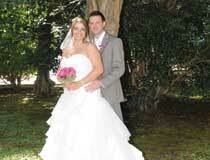 Visual memories of your special day can be organized in the beautiful garden and park. 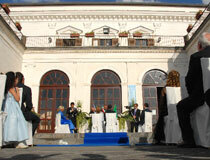 We will suggest a variety of local venues for your reception, depending on your taste, budget and number of guests. Of course, we’ll also be able to make accommodation arrangements for you and your party in this very beautiful part of southern Italy.